Get ordained immediately at the Church of the Latter-Day Dude! 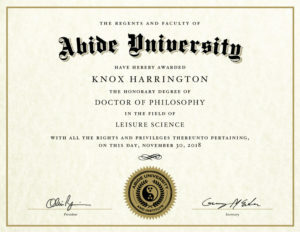 Become an official "Dudeist Priest" right away. It's totally free and there are no obligations. Entries marked with a red asterisk (* ) are required. NOTE: If your confirmation email doesn't appear in your inbox, please check your spam/junk folder. Thanks! Please use your real name. This is an official document. NOT YOUR BIRTHDATE. Please enter today's date, the date of your ordination. This is in US format (MM-DD-YYYY). You must enter a real email address or you will not be ordained. Don't worry - we will not share your address with anyone. How did you hear about Dudeism? A friend? Google? Facebook? An advertisement? A website? Please let us know. You can add as much or as little information as you like. Please tell us your city and country at least. We want to know where our Dudeist Priests are all around the world. I vow to uphold the principles of Dudeism: To just take it easy, to be dude (easygoing) to everyone I meet, and to keep my mind limber. I affirm that this ordination is for me and not for someone else, or my dog or whatever. Please don't ordain your friends without their knowledge - Not only is it against the league bylaws, but we get spam complaints from people who didn't want to receive an ordination. Dudeism.com will email me confirmation of this ordination, and occasional updates. I understand that I can unsubscribe at any time.